Reskin of Domsarto's and tmz06003's BR class 158 model. 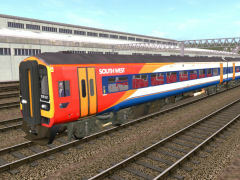 South West Trains livery. This asset features scripted destinations, night or day mode headlights, nameplates and passenger door controls with lights illuminating when the doors are open and authentic door sounds.